American artist Derek Yaniger’s vibrant work depicts a golden era populated with loads of the cool stuff we love; beatniks, hot rods, Tiki gods and the Las Vegas high life! A staple of the lowbrow scene and beyond, the daddy-o of retro-inspired illustration has created art from everyone to Marvel Comics and Cartoon Network, to the Viva Las Vegas Rockabilly Weekend and even designed tiki mugs for Tiki Farm. Derek was one of the first artists who got on board with Atomica, right from the get-go! You can currently see Derek’s original painting Say When at Atomica as part of their anniversary group show Vision Quest up until May 18th 2014… not to be missed! He also recently illustrated Kiddie Cocktails, a joyful book full of the coolest hooch-free cocktail recipes under the sun. The launch takes place at Atomica on Thursday 15th May 2014. It’s going to be a blast! Hi Derek! First up, you have a piece in our current exhibition Vision Quest called ‘Say When’ – can you tell us a little bit about it? 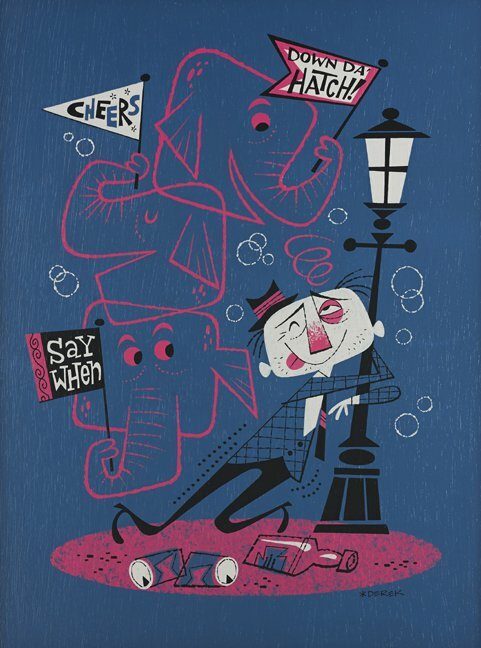 I dig pink elephants… like, the MOST! They fit perfectly in that “kiddie cute meets raunchy adult” vibe that flips my switches so very much! You also sent us some beautiful sketches, so cool to see how you plan a piece – can you explain your process? Draw, draw and then draw… and after a short snack break, draw some more! Sometimes an idea just rolls outta my coconut with very little scratchin needed… but then other times I gotta work n rework a scribble a whole heap of times before she speaks to me. Last minute changes to a piece are a drag so I wanna have it completely worked out in the sketch phase before I even ponder about color or technique. People love the fun references in your work and the world you create – can you tell us a bit about what inspires you? I grew up in the ′60s so I was surrounded by a whole mess of crazy art from the ′50s and ′60s… Mad magazine, Rat Fink models, my dad’s Jazz albums, my mum’s recipe books, my dad’s bartop knick knacks… I had no idea at the time, but I was soakin' up all the influences like a hungry sponge! Many moons later, after scribblin’ for Marvel and Cartoon Network and not really diggin it all that much, I started dumpin out all those memories from my snot-nosed days! I was finally dancin' to the beat of my own bongos and I never looked back, Jack! To this day when I run across a vintage image that I’ve never eyeballed before I still feel like a spoiled kid on Christmas morn! Tell us a little bit about the Kiddie Cocktails book – how did you get involved? My biz partner of many years, Stuart Sandler had been dronin’ on endlessly about this damned book idea he had so just to shut him up I said I’d do it! Now he owes me a book… Payback, she is an evil eye-gougin’ mistress ain’t she? I am really proud of what we did with the book… I think she’s a peach!! What is your favorite cocktail from the book? If I drank any of ‘em I’d probably stroke out!… I’ll stick with gin n’ corn squeezins. Artwise, It’s a dead heat for favorite… either Cherry Bomb, Dreamsicle, or Virgin Mary… I think I’m kinda leanin towards Dreamsicle. Somethin’ about that one just does me in! We know you are a tiki fan and have designed several tikis mugs – we are currently experiencing a bit of a tiki revival in the UK which is great! What appeals to you about tiki culture and why? That is great!…Unlike any other retro theme that I dig, Tiki has it all! The music, the crazy booze drinks, the hideous tikis, the wild wahines, the nutty threads! Every damn thing that I dig about mid-century lives in bamboo huts filled with tiki nuts! Now let me put you wise… I loves all them other themes ( Rockabilly, Hot Rod, Burlesque, Lounge, Jazz, Beatnik, Cocktail ) just as much, it’s just that it all seems to come together in the wild world of Tiki… ya dig me? Lastly, what is up next for Derek?! Lots of new stuff stewin on the stove! Kiddie Cocktail book release… A gallery exclusive print release at the Hukilau this Summer… New show print release and Kiddie Cocktail book signing at the Tiki Oasis in August…New serigraphs and other nutty surprises for Mr. Retro and Atlanta’s DragonCon in September… A new Tiki Farm mug… A whole batch of new paintings for my upcomin’ Outré show in Australia this October… I’ve been hoppin’ like my jeans are full of jumpin’ beans! !